Teaching middle school history should move your child to begin thinking on a higher level. But, you should also awaken the love of history. It’s not easy to find the balance between the two concepts. 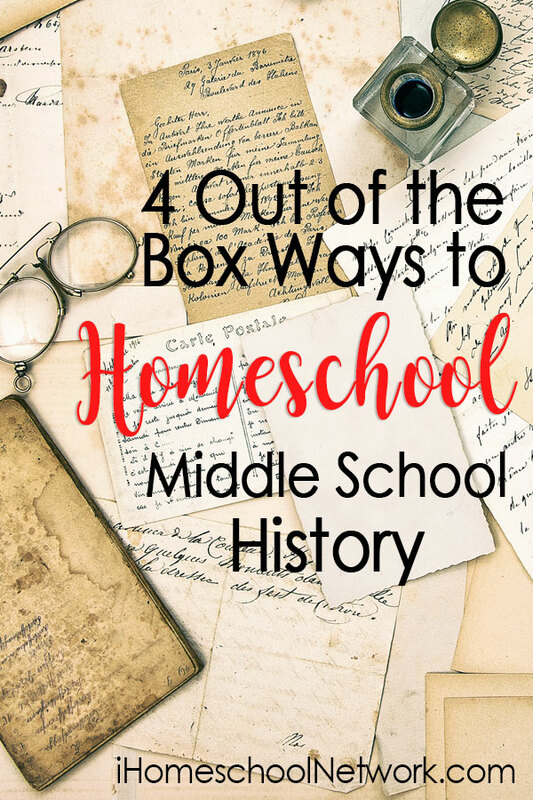 Here are 4 out of the box ways to teach middle school history. Read about historical people to understand their feelings and emotions. Middle school kids can look beyond their own lives and step inside the shoes of others. Use this time in their development to now focus on famous historical people. Events become meaningful when they surround the lives of famous persons like George Washington, Archimedes, or Alexander the Great. Instead of studying events in isolation, learn to connect them to a person who had ideas and feelings. For example, look at a few facts about Alexander the Great. The conquests made by Alexander the Great become memorable when your middle school kid reads about his earlier tutorship by Aristotle which influenced the way Alexander governed. However, did his ruthless nature also affect how he treated conquered lands? Kids at this age love to argue. Put it to good use by giving them a chance to analyze complex persons. Visit famous or not so famous landmarks and historical places. A cemetery is not really a famous place, but it’s an interesting place to read a few facts about the lives of people of the past. On the other hand, an abandoned mining town we visited made for a lot of discussion about history, how the economy affected local people, and how people didn’t forget their culture as they adjusted to conditions around them. Learning topics like the agriculture revolution in isolation can make even the most excited history buff turn history hater. Because history covers so many topics, I find it better to introduce potentially boring topics alongside a field trip to historical places. If you want to teach about the local economy, then a field trip to a local historical home can bring learning alive. Look at these 22 Awesome Homeschool History Field Trips to grab another idea or two. Step back in time. Middle school kids love to dress up in historical costumes. When my kids were real young, I would dress them for local history homeschool events. However, when they entered middle school, I wanted to make the time not just about fun, but about meaningful learning too. When we attended our local history co-op each child would have to research how his costume should be designed. A little secret between you and me is that while my kids researched about their historical costumes, they also explored little bunny trails learning about significant events, culture, and inventions about the time period they were researching. Then, learning history is something your child looks forward to when you ask them to research about historical costumes they want to wear versus you commanding research on a history topic. I always managed to ask a few questions about their research under the guise of understanding how they wanted their costume to look. Host a history co-op. And no, I don’t always want to meet up with other families. Talking to several moms in my history co-op, we all came to the same conclusion. Although we may not feel the need to meet up with other families, our middle and high school kids thrived in an environment with others. Using their excitement to meet up with others, we met once a month to let our kids talk about their history topic and make it come alive. One year, each family chose an ancient civilization they wanted to learn about. I outlined a few doable guidelines. Each family (not kid) had to have a poster board of some kind to explain the civilization they’re studying about, share something with the group that is hands-on, and of course dressing up was always encouraged. Some families used discarded pizza boxes for visual displays. Others just made poster board and some did a trifold presentation. We had food from tea and scones, to egg drop soup and Mongolian beef. Hands-on items from LEGO pyramids to Egyptian clay cartouches made for a fascinating study of history. Although all of your kids can work together on this project, our focus was to encourage our middle and high school kids to take the lead in coming up with ideas and in preparing research. Included in the presentation, the older kids had to outline key points and talk in front of the group. Some kids didn’t want to do this, but as parents we knew confidence soars when a child has the experience of public speaking. Your kids won’t forget learning history like this. More important, your attitude towards teaching history counts. If you’re enthusiastic about teaching history, it will be contagious. Your kids will be inspired. With less emphasis on text books and more interest focused activities, history will grab their attention and will be relevant. Have you tried one or two of these out of the box activities?